Here you will find descriptions, images and supporting materials of various creative scholarly activities organized in the table of contents below. Click the links in the table of contents to jump directly to a category or project within the page, or scroll down to read through the full collection. Because this file contains a large quantity of images, it is suggested that you allow the page to load fully before scrolling down to read or using the ‘jump’ links below. Typically, a solo exhibition is the end result of one to three years works in the studio, from experimentation to creating works and then an exhibition. My work has been shown in one-person exhibitions in Los Angeles, New York, Boston, Miami, Dallas, San Francisco, Vienna, Florence, and London, and in numerous regional, national and international group exhibitions. A variety of mediums have been exhibited including painting, ink, photography, sculpture/installation, and experimental photo-painting combinations. Additionally, my work has been acquired for permanent collection in museums, corporate and other private collections including the Solomon R. Guggenheim Museum. A full list of is included in my CV. CAA Standards for Retention and Tenure of Art and Design Faculty). Over the years, my studio practice has been aligned and informed by concepts in science, and for the project Your Body is a Space That Sees I have drawn directly from the history of astronomy for a series of large-scale cyanotype prints. The works employ visual and conceptual tools of science to map a visual history of the astronomical discoveries made by women with an emphasis on a group of women working at the Harvard Observatory in the late 1800’s known as the ‘Harvard Computers’, or ‘Pickering’s Harem.’ This two-year project is supported by a National Endowment for the Arts, Artworks Grant, and was recently granted a Distinguished Research, Scholarship & Creative Activity Award by the Chancellors Office and the Office of Research and Sponsored Programs Administration. This project is multifaceted and includes four phases: research at Harvard University’s astronomical glass plate archive, the creation of cyanotype artworks, exhibitions at the Delaware Contemporary and the Guggenheim Gallery at Chapman University, and the publication of a book with works and essays. Glass plate of magellanic clouds from Harvard collection taken in the late 1800’s, 11×14 inches. This plate is the reference for the cyanotype ‘The Magellanic Cloud’ and in the process video shown below. In spring 2016, I took my first research trip to Harvard to document and study the extensive archive materials, including the vast collection of astronomical glass plates, journals, and photographs. After identifying the specific plates that the ‘Harvard Computers’ made notations on or used to create classification methods, I then used those visuals as inspiration to create large paintings on semi-translucent paper. These are then used as negatives in a cyanotype printing process and exposed to the sun. These works are multi-layered in process and meaning, originating with a photographic plate reference used to create a painted image, then transferring back to a positive photographic image by being exposed to our star. The results of this process are large-scale works (6 x 4 feet and 6 x 6 feet) and printing is done with the assistance of Chapman University art majors involved in the BURN program through Wilkinson College. It has been exciting to involve my students in the research and creation phase of this project. Magellanic Clouds, 2016, cyanotype print (left), ink painted (negative right), both 74 x 74 inches. These technically experimental cyanotypes are conceptually parallel to the early methods used in astrophotography to map, record, and study the night sky and reconstruct a visual canon of astronomical discoveries for both the art and science community. The first of the exhibitions for these works will be at the Delaware Contemporary March 25th – June 26, 2017, with a symposium held on April 29th, 2017. This work will travel to a gallery exhibition in Los Angeles (dates to be determined) and then an exhibition at the Guggenheim Gallery at Chapman University. A book will accompany this exhibition with written contributions about the night sky from Dava Sobel, Dr. Lisa Randall, Dr. Janna Levin, Dr. Anna Leahy, and Jennifer Oulette with catalog design by Claudine Jaenichen. Cyanotype printing process and the making of ‘The Magellanic Cloud” for Your Body Is A Space That Sees. When the French comet hunter Charles Messier came across fuzzy objects in the night sky or heard about them from others, he would take note ‘of objects to be avoided while hunting for comets’ so he could set them apart from the grand prize: a lonely, wandering comet. Messier was slow in amassing an astronomical catalog filled with galaxies, clusters, and nebulae. His catalog of objects numbered 103, posthumously reassessed to 110 based on his journals and drawings. Messier’s story is about the experience of discovery and all the things we find when we are not seeking them. Deep Sky Companion is a series of 110 pairs of paintings and cliché-verre prints of night sky objects from the Messier Catalog, highlighting Messier’s hand in discovery. Each painting was created in ink on semi-transparent paper, which was then used as a negative to create the positive photographic equivalent using standard black and white darkroom printing. This process connects to the historical drawings by Messier, here re-drawn and then turned back into positives through a photographic process mimicking early glass plates astrophotography. On view at the Cahill Center for Astronomy and Astrophysics at Caltech from June 5th- December 18th, 2016, is a site-specific edit of Deep Sky Companion comprised of 110 telescopic disks made from the positive prints that explode through four stories of Thom Mayne’s extraordinary architecture. Messier’s Catalog of original drawings and observations is reimagined and open for the experience of rediscovery. The unique catalog for the Deep Sky Companion exhibition has been designed by Claudine Jaenichen and features a glow in the dark cover and two pull out posters of Messer’s 110 objects. Lia Halloran and David Ross during installation planning at Cahill Center for Astronomy and Astrophysics, Pasadena, CA, 2016. Published by CalTech, Pasadena, CA, 2016. Wunderkammer, or Wonder Rooms were early private cabinets of curiosities, which contained collections of objects, minerals, and taxidermy animals of the natural world which science had yet to categorize. For the exhibition ‘The Wonder Room’ I created over 30 new works for the SACI gallery based on specimens in the oldest science museum in Europe, La Specola. Still located in its original location next to the Pitti Palace, it contains a famous collection of anatomical waxes from the 18th century. Several years ago I spent a week in La Specola documenting various parts of the museum and was especially fascinated by the Monkeys and Hummingbirds because of their macabre and delicate nature. Documentation (notes, drawings, photographs) of these species was used as a reference to paint a negative in reverse, which was then used in a darkroom to create a positive image of the creatures. The result is an image strange in nature because it is not entirely drawing, or entirely a photograph either. Many of the creatures on display were collected on hunting expeditions by members of the Medici family. They represent an early fascination with the natural world and attempt to preserve, categorize and classify. In tandem with the exhibition, I was invited to give a public artist lecture at SACI on January 23rd in the Clayton Hubbs Lecture Hall. This exhibition was my fourth solo show in New York with DCKT Contemporary and an extension of my previous exhibitionSublimation | Transmutation at Martha Otero Gallery in Los Angeles. Large-scale works feature an unusual technique of laying ink on drafting film; the human form and the passage of time is simultaneously considered, where the organic body experiences a sublimation into the realm of the inanimate. Referencing rocks and crystals collected in my studio, I coerce the controlled movement of the ink from solution into solid. This process begins less at the moment the ink is applied to the drafting film, but more at the point where the deep blue pigment undergoes a ‘self-reanimation’ and unpredictably migrates over the surface. The current body of these works is titled Passage based on the history of the Los Angeles River and construction of waterways around the history of urban planning for the city of Los Angeles. In many ways, each of the locations I have photographs represents a double portrait: capturing the urban landscape of the individual city, and then overlapped with a self-portrait of my interaction within the space. In 2013 my work from the series Dark Skate Miami was included in an extensive summer exhibition over four months with over fifty artists in a city wide exhibition titled Cash, Cans and Candy, curated by Katrina Dworczak. In connection with the exhibition, I was invited to a week-long residency with Hilger NEXT to make site-specific Dark Skate photographic work in the city of Vienna in which I asked Chapman BFA graduate Adam Ottke to Vienna as with me where we created a series of works titled Dark Skate Vienna. This work was then exhibited in a solo exhibition in October 4th- December 7th, 2013. Hilger NEXT has a substantial International reputation with three separate gallery locations in Vienna, a roster of established and emerging artists that publishes several hardcover exhibition catalogs per year. The catalog for the exhibition can be found here. Another site-specific body of Dark Skate photographs were created over a period of eight days in the city of Miami, that were on view in a solo exhibition at Fredric Snitzer Gallery in Miami, FL. Notable solo exhibitions this work was solo exhibitions at DCKT Contemporary in New York, at Pulse in London, and at LaMontagne Gallery in Boston, MA. Dark Skate has been included in various group exhibitions nationally and internationally and has been reviewed in several respected publications including; The New York Times, The New Yorker, The Los Angeles Times, LA Weekly, ART News, The Village Voice, Time Out New York, New York Magazine, The Boston Globe, The Boston Phoenix, LA Weekly, Foam Magazine and many more, and a interview where I discuss the process of making the Dark Skate series was aired on the FOX network’s Fuel TV for the program The Daily Habit. Photographs from this series have been acquired by several permanent collections including the-the Solomon R. Guggenheim in New York, and the piece “Dark Skate / Griffith Park” was on view in the exhibition Haunted: Contemporary Photography/ Video/ Performance at the Guggenheim Museum in Bilbao, Spain. Below is a working draft of a documentary film by Sandie Louit about the making of the photographic series Dark Skate / Passage. It is currently undergoing final edits and music composition and will be completed in September 2016. Lia Halloran on Fuel TV, October 2008, Fox Network. Sublimation | Transmutation in Los Angeles at Martha Otero Gallery and explore investigations into the human form, the passage of time, and the behavior of natural elements in the guise of contemporary art practices where flesh undergoes a metamorphosis into crystallized forms. Close friends, used as live models, visually metamorphose into crystallized forms. The dual depiction becomes a performance; the unpredictable nature of the heavy blue ink acts upon and within the smooth, oily paper. These works area negotiation, engaging in a game of action and reaction via ink pen, creating an image fluctuating between strict representation, the intangible object, and the inherent fluidity of the medium. This exhibition featured an incarnation of the Periodic Table of Elements, re-interpreting and combining figures into various chemical states of the 118 elements. 118 individual drawings, presented in the same layout as the classic Table, serve as capsules of potential energy. This exhibition was reviewed in Art Voices Magazine and In the Make. Left: Anthodite, 2011 Ink on drafting film, 84 x 60 inches. Center: Cynite, 2012 Ink on drafting film, 84 x 60 inches. Right: Apophyllite, 2012 Ink on drafting film, 84 x 60 inches. COLLIDER is the collaborative team of LA-based artist, Lia Halloran and Sarah Strauss of BigProtype Architecture in Brooklyn. Both artists use this opportunity to push beyond the normal parameters of their practices and challenge each other to play and experiment. Introduced in graduate school at Yale University in 1999, (Folding Unfolding) is the result of their conversations exploring energy and gravity, form and order, lesbians and skateboarding and, most recently, the Cave of the Crystal Giants in Mexico and the molecular organization of crystals. Expanding upon Halloran’s The Only Way Out is Through, a series of crystal landscape paintings based on the Naica Mine in Chihuahua, COLLIDER researched the molecular structures and physical formations of different crystals. Developing 3D digital models to understand the complex geometries at work, they discovered crystals are highly ordered and repetitive; yet the formations themselves are largely influenced by their environment yielding organic, non-repetitive clusters. Utilizing cutting-edge 3D modeling technologies and advanced laser cutters, COLLIDER has replicated the forms of crystals (borax, gypsum, neptunite and quartz). Fabricated from Ultralight®, crystals stand 4 to 6 feet tall; yet weigh only 40 to 70 pounds. The pristine surface, rock-solid form and ambiguity of material creates tension between experience and analysis and provides a meditation on the forces of weight, mass, gravity and space. This work was also shown at the art fair Pulse, in Miami, FL and was reviewed in Sculpture Magazine. Sarah Strauss spent spend three weeks in Spring of 2012 with my class ‘The Intersection of Art and Science’, to co-teach the 3D Modeling programs Collider utilizes and remake some of the crystal structures in our installation. Finally, Sarah Strauss joined me as my co-instructor in Florence, Italy in Interterm January 2014 for the course ‘The Origins of Art and Science’ and contributed lectures on the way astronomy played a role in architectural decisions in the Renaissance including the first planetarium and hidden sundials among the facades of the churches in Florence. The exhibition includes new paintings of crystal caves and personified icebergs, along with ink on vellum works using science and the natural world to map out physical and psychological spaces and addresses time in ways that stretch our notions of perception. The paintings of crystal caves explore a submerged space that is finite and bounded. The paintings accentuate the unreal quality of crystal formations and the claustrophobic environments of caves. A sense of disorientation merges with the inanimate and the imagery examines discernible entropy and decay. The environments are impossible and chaotic; the spaces are both beautiful and terrifying. The works are based on last decade’s discovery of the Cueva de los Cristales in Naica, Mexico where monumental selenite crystals reaching over thirty-five feet long look more like architectural beams than mineral growth. This was the first New York solo exhibition of my work. The six figure paintings in the show explore physical forces of nature and the possibilities of how these forces interact with, intersect and fragment the body. Physics and unseen natural forces around us such as light, motion, dissipation, centrifugal forces, gravity, and magnetism inspire the paintings. Laws of physics that are familiar and observable become just as important as the figures they interact with. The figures lie in an unresolved point between giving in and becoming overtaken, experiential in their environments. The title of the show, taken from an exhibit at The Museum of Jurassic Technology in Los Angeles, is a reference to magnetism and connectivity. Magnetic attractions and repulsions are attributed to governing everything from particles, planetary action, tides, wind, love, sympathy and hatred; all are ruled by this force of nature. These works explore the idea that familiar forces around us play more intimate roles than simply providing us with glue to the earth. “Space Adventures, Real and Imagined”, New York Times, 08/09/2008. My works have regularly been included in gallery, museum, and art fair group exhibitions, which are all listed on my CV. Below is a brief highlight of five shows. Much of contemporary photography and video seems haunted by the past, by the history of art, by apparitions that are reanimated in reproductive media, live performance, and the virtual world. By using dated, passé, or quasi-extinct stylistic devices, subject matter, and technologies, such art embodies a melancholic longing for an otherwise unrecuperable past.Haunted: Contemporary Photography/Video/Performance documents this obsession, examining myriad ways photographic imagery is incorporated into recent practice and in the process underscores the unique power of reproductive mediums. These mediums, like performance, are defined structurally by the layered temporality they present: they viscerally refer to past and prior acts that are perceived in the present in such a way as to bring the past into the present ,to metaphorically bring the dead back to life, and thus to suspend the viewer or audience between history and the immediate. Often the images captured by these technologies are literal documents of the past that bear witness and thereby substantiate the very existence of experiences otherwise only fleetingly and troublingly maintained as elusive memories. It is because of this quality that photography, like performance, has been seen from its inception to have a kind of magical power, if not to transcend death then to constantly remind us, as a memento mori, of the inexorable passage of time. 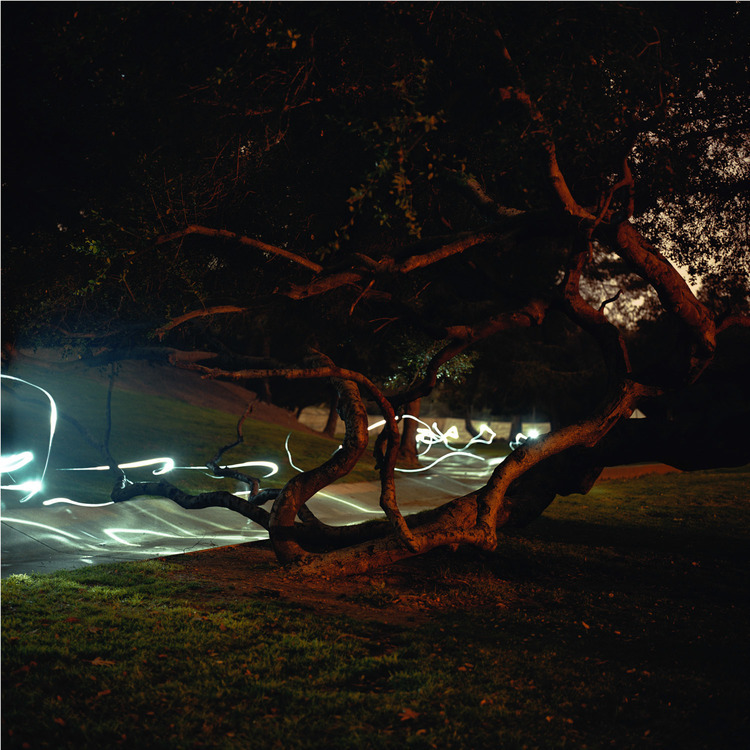 Pictured above left: Dark Skate Los Angeles, Griffith Park, 2007, c-print, 48 x 48 inches. Acquired for Guggenheim Museum’s permanent collection in 2010. Superficiality and Superexcrescence features work by Amy Adler, Rebecca Campbell, Marcelino Gonçalves, Lia Halloran, Salomón Huerta, Elliott Hundley, Kurt Kauper, Elad Lassry, Blue McRight, Joel Morrison, Kori Newkirk, Tia Pulitzer, and Catherine Sullivan. Conceived in opposition to the hard and fast interior/exterior dialectic that cultural theorists like Fredric Jameson have used to contrast the modern and postmodern eras, this exhibition offers a close examination of the work of thirteen LA-based artists who are variously committed to the notion that deep cultural meaning inhabits–as code, nuance, and implication–the outer husk of the people and objects that populate our day-to-day lives, remaking superficiality not as a condition to be resisted, but rather one to be analyzed and manipulated. For these artists, surface and substance are not opposed properties, but equally present. Accordingly, each of these artists focuses on what is latent over what is manifest, on implication over demonstration, and on faint whispers over loud, declarative statements, not with the aim of privileging appearance over essence, but rather to suggest that appearance and essence co-mingle in the surfaces that surround us to generate cultural meaning. This exhibition is initiated and sponsored by FOCA, organized by OTIS Ben Maltz Gallery, and curated by Christopher Bedford, Curator of Exhibitions at the Wexner Center for the Arts, The Ohio State University; Kristina Newhouse, Deputy Director of the MAK Center for Art and Architecture at the Schindler House in West Hollywood; and Jennifer Wulffson, an independent art historian and former senior editor of the Bibliography of the History of Art at the Getty Research Institute. The three curators are recipients of the Fellows of Contemporary Art’s Curators Exhibition Award. Space is the Place, curated by Alex Baker and Toby Kamps for Independent Curators International was a traveling exhibition that included three major paintings and five smaller drawings. This exhibition traveled to five museums in the United States from 2006-2008 and was accompanied by an exhibition catalog that can be found here. The New York Times reviewed my paintings at the Hudson River Museum Location. The full list of venues were; Cranbrook Art Museum, Bloomfield, MI; Bedford Gallery, Walnut Creek, CA; Scottsdale Intersection of Art Museum of Contemporary Art, Scottsdale, AZ; Contemporary Arts Center, Cincinnati, OH; The Hudson River Museum, Yonkers, NY. Pictured above: Installation at Hudson River Museum, Yonkers, NY, 2008. From left to right: Alma Allen, Rebecca Campbell, Heather Brown. Alma Allen, Hernan Bas, Heather Brown, Rebecca Campbell, Ain Cocke, Zackary Drucker, Carlee Fernandez, Patricia Fernandez, Ben Jackel, Tim Hawkinson, Lia Halloran, Laura Krifka, Monica Majoli, Catherine Opie, Jen Stark, Allison Schulnik. Artist Rebecca Campbell and I applied to Calstate LA University Gallery to curate an exhibition titled Better Far Pursue a Frivolous Trade by Serious Means, than a Sublime Art Frivolously which evolved from our mutual interest in artworks that represent a simultaneous experience of beauty and horror and how romantic where representation of the Sublime exist in contemporary art. This theme has trailed through both of our art practices and through various ongoing dialogs we have discussed the artists and influencer that visual engage in this subject and inspire our work and were thrilled to be able to include our dream list of artists. Transcendence manifests in various ways yet in every culture, age, and gender, it is recognized as an essential force. This exhibition explores artworks that engage a metaphysical site where filters of language, history, and pretense are abandoned, and one is invited to consider transcendence, an experience that happens with or without theoretical permission. Roland Barthes in his classic work ‘Camera Lucida’ refers to this direct, immersive and perhaps experience as the “punctum” denoting the wounding, moment of puncture, and personally touching detail, which establishes an exceptional relationship between a viewer and an object or image within it. A key component of this experience, although temporary, is its transformational quality, releasing one from the quotidian demands of pragmatism into a new paradigm of pure perception. It is our intention to explore specifically the idea that the sublime element in a work of art often eludes our own conscious ideas about what we are making as artists and experiencing as viewers. It may even exist in contrast to the stated intentions of a maker or the articulated experiences of a viewer. There are many different routes to the sublime. Some art makers attempt access through the physical act of creation, viewers through looking, magicians, shamans, naturalists, and countless others through alternative means but all with a drive to experience transformation. ,Curated by Lia Halloran and Lisa Randall, Published by Chapman University, 2011. While I work primarily on solo studio projects some of the most exciting and stimulating undertakings have been working with other artists and thinkers, which has created an opportunities to challenge myself in ways I would most likely never arrived at alone. These collaborations have lead to publications, exhibitions, coursework and general engagement that has fueled my curiosity and illuminated new paths. Print edition, by Kip Thorne PhD, Published by WW Norton and Company, November 2014, 320 pages, 1st edition 99,999 copies. Illustrations on pages 40, 41, 151, 230, 299. In January of 2014 Dr. Leahey, Claudine Jaenichen and myself published a co-authored article that explores balances of ritual and experimentation, intellect and empathy, and self- expression and audience in creative writing, studio art and graphic design. Examples of teaching practices and other pedagogical commonalities in the three areas are also main focal points. You can find the full article here, and this piece is included in the upcoming book What We Talk about When we Talk about Creative Writing, edited by Dr. Anna Leahy, Publisher: Multilingual Matters. While there exists some inquiry into the relationship between creative writing and composition, very little investigation has been done into the relationship between creative writing – its pedagogy and practice – and the visual arts. That lack of scholarship is likely due to the difficulties we have conversing in meaningful ways across academic units. This conversation essay is an exchange across disciplines and a blending of theoretical approaches and practical experiences that asserts, ‘creative writing and visual arts – both studio art and graphic design – share underpinnings as academic disciplines of practice, have overlapping goals for students, and address common areas of artistic exploration such as the roles of ritual and experimentation, of self-expression and audience, and of intellect and empathy’. Creative Writing and the Visual Arts. I am committed to expanding my studio practice in various modes of research and development and in January of 2016 have been awarded a National Endowment for the Arts Artworks grant for the two-year project, Your Body is a Space That Sees. The projectYour Body is a Space That Sees is a series of large-scale cyanotypes based on the discoveries and contributions of women in astronomy as a historically reinterpreted visual catalog. The process of creating these works using a painted negative (cliché verre method) to create large and cyanotypes works mimic early astronomical glass plates moving between transparent surfaces to a photograph without the use of a camera. The of series of approximately 40 large scale works will interpret a fragmented history and represent a female-centric astronomical catalog of galaxies, nebula, spectra drawing from narrative, imagery and historical accounts of a group of women known as ‘Pickering’s Harem’ or the ‘Harvard Computers’ from the late 1800’s who worked under the directorship of William Pickering and made major contributions in classifying and identifying the heats of stars, stellar composition and even Cepheid variables which gave astronomers like Edwin Hubble the tools to measure the distance of the Universe. Research of source imagery has been done at the Harvard College Observatory and their extensive glass plate collection of over 500,000 stellar plates. Not only does the HCO house the largest astronomical glass plate collection in the world their unique lineage of having women on staff starting in 1892 lead to a rich and unique history of astronomy. This series of works will cumulate with exhibitions in both science and art institutions to offer an interdisciplinary re-visualization of the sky to the art and science community. The series of cyanotype pieces will be accompanied by an exhibition catalog with written contributions about the night sky from Dava, Sobel, Dr. Lisa Randall, Dr. Janna Levin, Dr. Anna Leahy, and Jennifer Oulette with catalog design by Claudine Jaenichen. The California Institute of Technology has received external funding to produce the exhibition and catalog for Deep Sky Companion at Cahill Center for Astronomy and Astrophysics running June 5th- December 18th, 2016. Deep Sky Companion installation at Cahill Center for Astronomy and Astrophysics, Pasadena, CA, 2016. The California Institute of Technology has received external funding to produce the exhibition and catalog for Deep Sky Companion at Cahill Center for Astronomy and Astrophysics running June 5th – December 18th. I am especially grateful for the internal support I have received while here at Chapman, which has given me the opportunity for travel, equipment, supplies and research that would have been otherwise impossible. I have received the following three Creative Scholarly Grants: Framing support for ‘Deep Sky Companion’ (2015), Darkroom materials for ‘Your Body is a Space That Sees’ (2014), and Digitizing Dark (2012). I have received three Personalized Education Grants, Mt. Wilson Observatory and a Time Travelling Sound Bath Sound Bath, Course Additions to ‘The Intersection of Art and Science’ (2013), and ‘The History of Art and Science’ (2012). I was honored to receive the Junior Wang-Fradkin Professorship in Spring of 2014, which is a two-year monetary award to further teaching and scholarship. The award was founded in memory of Hua-Cheng Wang, professor of political science, diplomat, and expert on international law; and Cheng-Mei Fradkin, a distinguished teacher, scholar, and administrator. The announcement can be found here. Additionally, Dr. Anna Leahy and Claudine Jaenichen and I were awarded a co-teaching award for the course UP that was team-taught in Spring of 2016 and most recently I received the Distinguished Research, Scholarship & Creative Activity Award this May 2016 by the Chancellor’s Office and the Office of Research and Sponsored Programs Administration. Chapman’s Intersection Of Art And Science students at the Integratron, Joshua Tree, CA, Spring, 2015. In July of 2016, I will participate in the artist residency at Pioneer Works in Brooklyn, NY. This interdisciplinary studio space has been growing over the past few years and earning international recognition as an innovative collective of art-making, public lectures, and educational summits. Pioneer Works’ Studio Residency Program launched in the Fall of 2012 and supports practitioners of all kinds in the arts and sciences. Past residents have hailed from near and far, including Germany, France, Israel, Ukraine, Costa Rica, Korea, and other countries of origin. Situated within a spectacular former iron works facility, studios are arranged over two floors overlooking exhibition and performance spaces. This unique, shared environment affords opportunities for cross-disciplinary dialogue and collaboration with other exhibiting artists, staff, and the local Red Hook community to which Pioneer Works is deeply connected. In addition to studio space, Pioneer Works also facilitates wide engagement with the greater New York art world, including ample open studio opportunities through our public Second Sundays events, which attract a diverse constituency of viewers; monthly resident salons during which work is presented for feedback; and bi-monthly studio visits with critics, curators, and other arts professionals. Past visitors have included Flash Art editor and Artforum contributor Laura McLean-Ferris, BOMB editor Orit Gat, and Art in America editor Wendy Vogel, among others, artists David Brooks, Michael Joo. In July of 2013, I was invited by Hilger NEXT for aN artists residency in Vienna to create site-specific Dark Skate piece as described above. The gallery regularly hosts a variety of artists, curators, and collaborators in a resident apartment they have created in one of their three exhibition spaces. In association with the exhibition Your Body is a Space That Sees and the spring symposium on April 18th, 2017 public outreach is planned to collaborate with the project JUMP!STAR, organized by the artists George Ferrandi for a public workshop on cyanotype printing. (http://www.jumpstar.love/) This project is named after Annie Jump Cannon, the deaf scientist and amazing human credited with developing our star classification system. In association with our on-site weeklong residency Sarah Strauss and I conducted two educational workshops to demonstrate the technology of laser cutting and 3D modeling where participants could build mini gypsum crystals out of laser cut paper. Screenshots of work-in-progress files. Left: Sarah Strauss, Lia Halloran and collaborators.